Sebastian Schaffer from Austria is the head behind the project “Virtual Intelligence”. 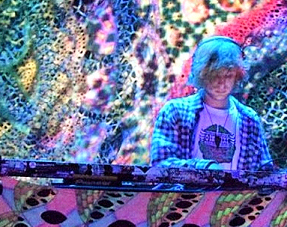 Summer 2011 was the first time he came in touch with psychedelic music at the Ozora festival. After this amazing experience he fell in love with this music . 2013 he started to make own partys to play his first Psy- Trance Dj-sets. As there weren´t so many Hitech/Dark Djs in the region he lives the people asked him to play a Set at the party. In 2014 he was at his first Hitech Festival. This was the reason why he came on the fast side of psychedelic trance! Motivated and inspirited by the music he wanted to make some of this incredible stuff too. He started to produce with Ableton. In 2015 he released his first track on Popol Vuh Rec/Tripura Yantra Rec. Half a year later he got member of his first label “Monkey Business Rec” from Germany. Soon after he was introduced in “Masters of Puppets Rec” from Austria. Soon he releases his first EP on Monkey Business Rec. Let´s see what the future brings.